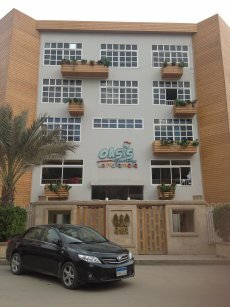 The Oasis International School in Cairo welcomes children from age 3 to 18 and follows the International Baccalaureate. 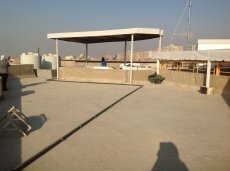 It is a French speaking school, with English and Arabic taught from age 4. The school is taking a whole school approach to outdoor and adventure learning. 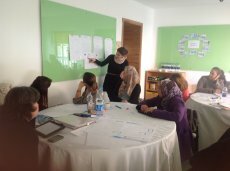 Three of us were fortunate enough to head to Cairo for three days of training in February 2014 to take a holistic look at how the school can achieve this. Tim Deighton (Adventure Incubator and Institute of Outdoor Learning) scoped Cairo and surrounds for possible visit opportunities, Jim Langley (Nature’s Work) worked with primary and middle years teachers exploring Environmental Learning Cards, and Anita Foster (School Grounds North East) worked with the teachers and assistants from La Maternelle (Kindergarten), to explore how they can use and develop their immediate and local environment to develop outdoor learning. 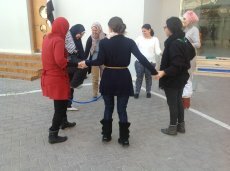 Day two looked at some of the practicalities of teaching and learning outside. A prioritisation activity helped to identify potential barriers to going outside, with a strong focus on finding ways of overcoming these. A mapping exercise also helped the staff to take a fresh look at the space they had, how it is currently used, and how things could be used differently. By the end of the training the staff were planning to develop the roof space as an area for outdoor learning and play as a solution to their lack of outdoor areas – watch this space. 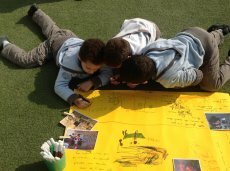 The team returned to Cairo a couple of months later for further training – information on how the Primary Years Programme took all their children on an outside visit can be found in this case study. A PE lesson? No - trying to make the shape of an igloo.